After my failure at composting last year, I decided that we needed a proper compost bin. So I asked my husband if he could build me one. I was thinking something really simple that I could just dump food scraps and yard scraps into, but my husband does not do simple. He came up with a plan and had a compost bin made for me in an afternoon. Do I have the coolest husband or what? He made it two sided so that when one side is full we can let it sit and turn it until it is compost while filling up the other side. Of course, there are little doors at the bottom so that you can shovel out the compost once it is done. And hey, if composting doesn't work out, we always have a place to put the kids if they are bad., right? On a totally unrelated note, have you ever heard of Tamra Davis? She's a film and TV director. She was the director of Billy Madison and also did an episode of Grey's Anatomy. Her husband is Mike D from the Beastie Boys. Anyway, I stumbled across her online cooking shows. It looks like she has some pretty good recipes. Her husband is vegan, her kids are vegetarian, and she does not eat meat or chicken. So I was excited to see what types of meals she comes up with for her family. She also has a cookbook out that you can purchase for $5 if you get an electronic copy. I want to try making her granola bars. YUM. Ok, I swear I have a point. After reading through some of her recipes, she mentioned that she referred to a smoothie made with a banana, milk, and yogurt as a milkshake. So I thought I would try that with my kids for dinner last night. We made pizza with a whole wheat crust that the kids helped me construct. Then I blended together a banana, a cup of plain yogurt, 2 cups of vanilla almond milk, about a tablespoon of agave nectar, and some ice. I called it a vanilla milkshake and the kids were in heaven. They were SO excited to have a milkshake with dinner. Your husband sounds like a great guy. The photo of the kids is too funny. I've been looking into agave nectar but didn't know anyone who has actually used it. Is it a good sweetner? Does it taste funny? I've tried using Stevia but it has a strange taste to me. ALSO curious about the agave nectar...and also tried Stevia, blech. Not at all impressed. Now I have a jar of it I need to figure out what to do with! But that compost bin...is...AMAZING! He is a fantastic find, that is for sure! I can't wait to see how it works out for you. I really want a compost bin, too. I would never have thought of agave nectar. I've made similar "milkshakes" but the nectar sounds like a great idea. You're hilarious. I love the shot of the kids inside looking all sad! What a wonderful husband you have. I love the shot of the kid in the compost bin, too cute. I will have to check out the agave nectar, I've been hearing about it a lot lately. 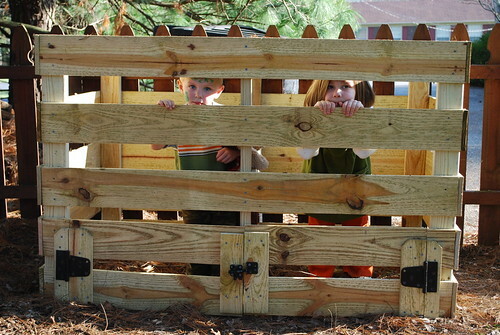 Compost bin as kid prison - hilarious!! !